Now that I have my camera back, I'm going to be playing catch-up this week! Let's kick things off with this outfit from awhile back when it was much, much warmer. Not that I'm complaining about the current weather of fifties and rain. I actually love it and am taking full advantage with a hot beverage and movie on the couch. What else am I loving? This full faux leather skirt! Can't wait to wear it more. Oh, and sorry for the crazy shadows. If memory serves, the sun was setting while I took these shots. The winner of the Go Chic or Go Home giveaway is Jessica. I will email you shortly about claiming your prize. Congratulations! That skirt is great. So perfect for fall. 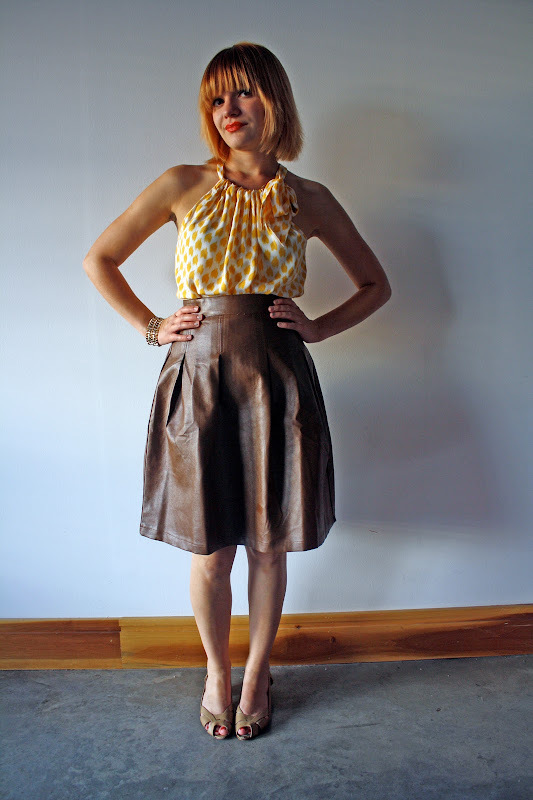 You look awesome in that faux leather skirt! I love the shape of it. Whomever thought putting pleats in a "leather" skirt would be a good idea was a genius!